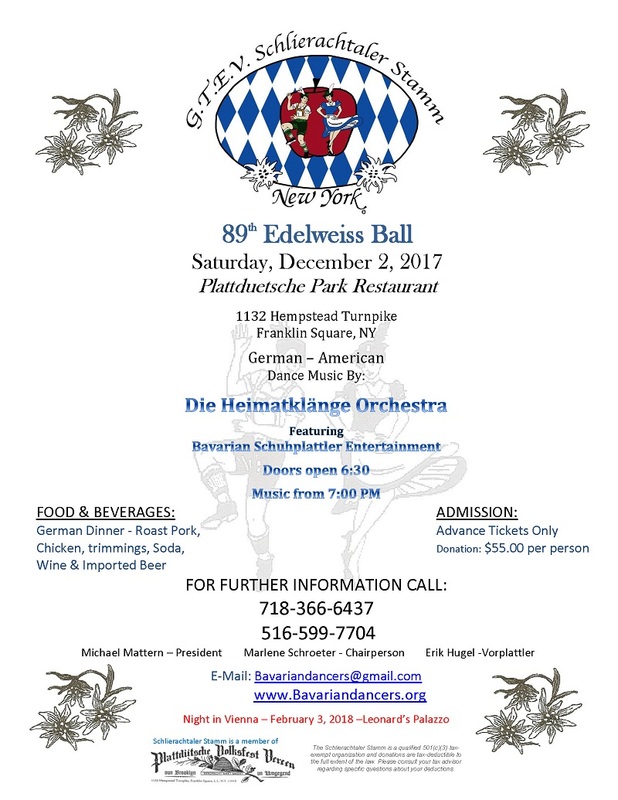 The GTEV Schlierachtaler Stamm is proud to announce their 89th Edelweiss Ball to be held on Saturday, December 2, 2017 at the Plattduetsch Park Restaurant in Franklin Square, New York. The Schlierachtaler Stamm is a New York based Schuhplattler club founded in 1928 by German Immigrants from the Schliersee region of Bavaria. Come celebrate a special evening in grand Bavarian style with the G.T.E.V. Schlierachtaler Stamm. The Schlierachtaler held its first Edelweiss Ball in November of 1928 in New York City and have continued the tradition every year since. They will again be performing their signature schuhplattler figure dance the “Muhlradl” or The Miller's Dance. This marching dance depicts with numerous figures the workings of a grist mill. The price of admission includes a traditional German dinner consisting of delicacies such as roast pork, chicken, and trimmings. Also include is wine, soda and imported beer. Music will be provided by Die Heimatklänge Orchestra for your dancing pleasure. Entertainment includes Schuhplattler performances by the Schlierachtaler Stamm and visiting clubs from the metropolitan area. Where and when: Plattduestche Park Restaurant 1132 Hempstead Turnpike, Franklin Square, NY Advance Tickets only at $55 per person. Doors open at 6:30 pm….dinner will be served at 7:00 pm.